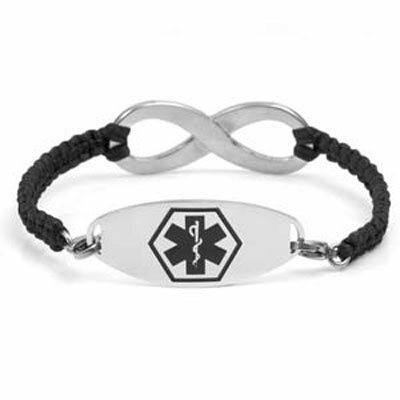 Add an infinity Medical ID bracelet to your daily ensemble and feel the positive vibes. The meaning behind an infinity bracelet is actually quite beautiful - it symbolizes eternity, empowerment, and everlasting love. Black satin macrame with two stainless lobster clasps makes this style interchangeable. Price includes one stanless steel Contempo Medical ID tag with black laser engraving and one black interchangeable satin macrame strand. No further discounts available on this laser engraved product. Caution not to wear this item in water as it may damage or stretch out macrame. SIZING: Take a soft cloth tape measure and wrap around wrist snugly. No wiggle room. If your wrist is not listed here, please do not order. There is no resizing available.